The story I would like to relate concerns my father, Sam Moss, more than me. My father was born in Munkatch, Czechoslovakia, what is now Mukachevo, Ukraine. There he attended the yeshivah of Rabbi Chaim Elazar Spira, author of Minchas Elazar, who was the Munkatcher Rebbe. In 1944, the Nazis herded the Jews of Munkatch into a ghetto, from where they were taken to Auschwitz and later transferred to Dachau. There they endured unspeakable trials, and at one point my father got very sick and was near death, but he was saved due to my grandfather’s intercession with a kitchen hand, Oscar Heller, who slipped him extra food which helped him recover. After the war, he made his way to Australia, where he married and built up a very successful textile business. I was born in Sydney, as was my brother. Because of his war experiences, my father was not religious. Indeed, between the time of liberation until 1956, he never even walked into a synagogue. He was just so angry with G-d because of everything that had happened to him. Only when I, his first son, was born, did he set foot in a synagogue for my brit. His travails continued when my mother passed away at age thirty-eight, at a time when my brother and I were teenagers. This happened just when my father thought he had gotten his life back together, and it made him more bitter and drew him even further away from Judaism. Then, to my father’s chagrin, I became Torah observant, and after finishing high school, enrolled in the Chabad yeshivah in Melbourne. This really upset my father, because he had rejected all that. Now his son was wearing a yarmulke and tzitzit! This was just too much for him. When he could not convince me to leave the yeshivah, he decided to go to New York to speak with the Rebbe about it. I think he thought he would make a contribution to Chabad, and the Rebbe would do what he wanted – tell me to leave the yeshivah. I really do think that’s what he had in mind. So the Rebbe stood up behind his desk, and then at some point in time, he came around and stood next to my father. He asked him many questions about the Munkatcher Rebbe and what it was like learning in his yeshivah. Then he began to ask him about the war – the ghetto, the camps, everything that happened to him. Answering these questions, my father broke down and started to cry. And the Rebbe put his arm around him. My father never talked to me about what happened that night, although he stopped trying to make me leave the yeshivah. Only recently did he tell my brother Chaim about it, and when I pushed him, he also told me. My father said that, when the audience was over, he felt like a great weight had been lifted from his shoulders. Years later – in the late 1980s – my brother and I came with our father to Chabad Headquarters when the Rebbe was giving out honey cake (lekach) during Sukkot. We were standing and watching what was going on, when the Rebbe noticed my father. He stopped the line and asked him to come over. They spoke for about three or four minutes. The Rebbe asked my father how he was doing and wanted an update on how things turned out since the last time they met, but my father never told us any details of that conversation. But he did tell us another story which has to do with Menachem Begin and the Rebbe. 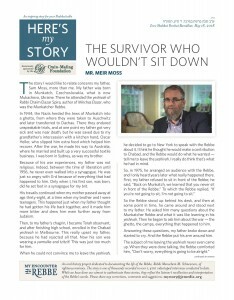 Begin explained that he thought this because the Rebbe had lifted up a whole generation after the Holocaust – he helped the Jewish people believe in themselves again. And my father could certainly identify with that. In the very early 1990s my father experienced a lot of business problems. He had invested considerable capital in the textile industry in Australia which collapsed due to Chinese competition. He and his partners had started out running small retail shops and then moved into textiles manufacturing, employing thousands of people in the industry, so the ramifications of their business collapse were quite significant. The Chabad emissary in Sydney, Rabbi Pinchus Feldman, convinced my father and his partners to write to the Rebbe, which they did. They thought they were asking for business advice, but they got something else instead. The Rebbe instructed them to check their tefillin, but none of them were putting on tefillin at the time. So they began to. And their business turned around quite considerably after that, even though it took years for their fortunes to be fully restored. I just find it fascinating that they were expecting to get some sort of business advice from the Rebbe, but they got another kind of advice altogether. This was very typical of him – to advise people to make of themselves a vessel which could receive the blessing from above. Mr. Meir Moss is a businessman who lives in Sydney, Australia. He was interviewed in August of 2016.